The Tau Society honors a committed and special group of benefactors who choose to include The Catholic High School of Baltimore in their estate plans or in any planned gift arrangement. Upon making an estate gift, these individuals become members of The Tau Society. To thank members, we invite them to participate in the annual President's Reception and recognize them in the Annual Report of Gifts. The society is named for the last letter in the Hebrew alphabet that resembles the cross. It is a symbol that St. Francis of Assisi cherished. Because The Catholic High School of Baltimore is sponsored by the Sisters of St. Francis of Philadelphia and both are committed to Franciscan values and mission, the Tau holds a special significance to our community. 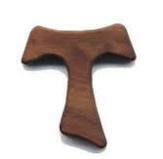 It has long been recognized as a Franciscan symbol of genuine hope and response in trust to the faithfulness of God. Because of his affection and devotion to this cross of Christ, St. Francis of Assisi used the Tau in his signature and to give his blessing. It is a sign of permanent conversion, the seal of the Kingdom of God, and a call to the service of others. While nearly every asset could be used to make a charitable gift after your lifetime, three specific assets make more sense than others. 1. IRAs and retirement plans. To name TCHS as the beneficiary of your IRA or retirement plan, such as a 401 (k), simply ask for a change-of-beneficiary form from your plan administrator. We will have use of the full gift of your lifetime-unlike your heirs, who could pay income taxes of up to 35% if they inherit it. 2. Cash. The most popular way to remember a charity in your will is a simple bequest of cash. You can leave a specific sum of money or a percentage of the remainder of your estate. You might also consider leaving your cash gift in honor or in memory of someone to make sure that person's legacy lasts forever. 3. Life insurance. Your life insurance policy or group term policy also makes a wonderful gift. Use life insurance policies you no longer need, and include Catholic High as beneficiary of a percentage or the full amount. Provide for your family's security. Name an executor or administrator of your estate. Incorporate trusts to reduce estate taxes. The directions you supply in your will are valuable to family members and heirs and may save the frustration of second-guessing. While contemplating a will can bring up painful and sometimes difficult thoughts, the process offers greater rewards than burdens. For more information, or for help to get the process of becoming a Tau Society member started, please contact Dori DiVenti, Director of Institutional Advancement, at 410.732.6200, ext. 243 or at ddiventi@thecatholichighschool.org.